lol ... remember him when he was a young kid. I am soo in loooovvvveeee with this hearthrob. lol. im watching hwang jin yi right now.. and OOO~LALA!!!! so cute.. i couldnt believe he was only 19! this boy sure is handsome. 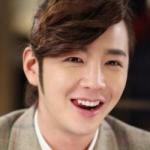 i love him in hwang jin yi. he's seriously SUCH a good actor. in Hwang Jin Ee, omg i fell in love. haha. over a drama/movie excpet for Taeguki. goshhhh hes SO cute and adorable and its hard to believe hes a month older than i aM! he has a baby face but such a charismatic deep voice. im so sad hes no longer in hwang jini. this dude caught my eye while i was watching hwang jini!! he is sooo hot xDDD looks so much more hot than before...since hes matured a bit..